At Spring Creek Dentistry, your trusted comprehensive dentist in Spring, TX, we understand the hesitation that many patients experience when it comes time to start thinking about dentures. Dentures of generations past, and dentures throughout popular culture are a source of embarrassment – they’re clunky, ill-fitting, and don’t stay put. Thankfully, with advances in modern dentistry, we can create a beautiful set of custom-made dentures that will look, feel, and function just like your natural teeth – only better! If you’re missing most or all of your natural teeth and are wondering if you’re a good candidate, or if you’re sick and tired of living with dentures that don’t look natural or don’t stay put, we would love to speak with you! Dentures at Spring Creek Dentistry are artfully crafted from tooth colored porcelain to match the exact shade and shape of your natural smile. 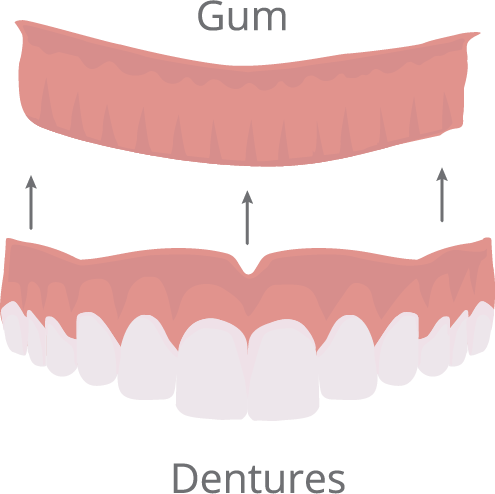 Your dentures will not only be beautiful, but strong and durable so you can enjoy your favorite foods with confidence, and rest assured your smile will be one your grandkids will remember for a lifetime. If you haven’t yet experienced significant jawbone deterioration from missing teeth, you may be a good candidate for implant supported dentures. Dental implants are the most recommended solution for replacing missing teeth, preserving oral and jawbone health, and anchoring restorations like crowns and dentures. If you have sufficient jawbone density, we can place four mini implants that serve as anchors to lock yours in place for a seamless fit. Take control of your oral health & call today to schedule! At Spring Creek Dentistry, we are proud to offer a comprehensive mix of services to provide all of your family’s dental needs under one roof. We have four amazing doctors and an outstanding team who can’t wait to meet you. If you’re ready to give your smile a second chance, we would love to speak with you about dentures. If you have any questions, or would like to schedule a consultation with your Spring dentist – Dr. Oakley, Dr. Henley, Dr. Miller, or Dr. Wendt – please contact us at Spring Creek Dentistry today at (281) 407-8333 . Please call us at (281) 407-8333 or fill out the form below to request an appointment.